The Purse d’Resistance is now a Backpack! Last summer, the Purse d’Resistance was created to carry all the necessities during a month of travel. Unfortunately, somewhere in the creative process, visual and textural interest trumped common sense. As a result, the base and body of a purse that was specifically made to travel through 5 airports, two train stations and multiple subway rides, was constructed of a beautiful, albeit structurally-challenged, apricot colored silk dupioni. Not my best engineering moment. Even with metal purse “feet”, a purse base sewn from a light-colored silk is just not going to survive a summer of travel. So, a remake, an upcycle, a re-engineering took place. 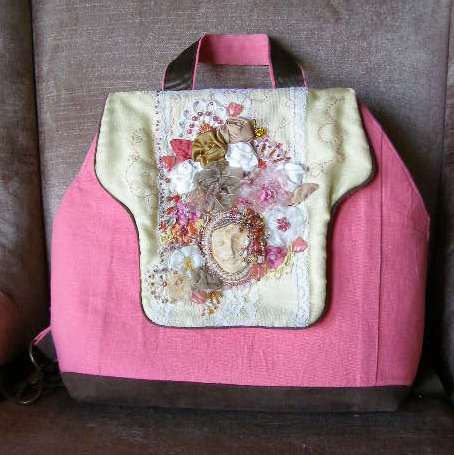 The embellished flap and hardware was re-used to create the Backpack d’Resistance. 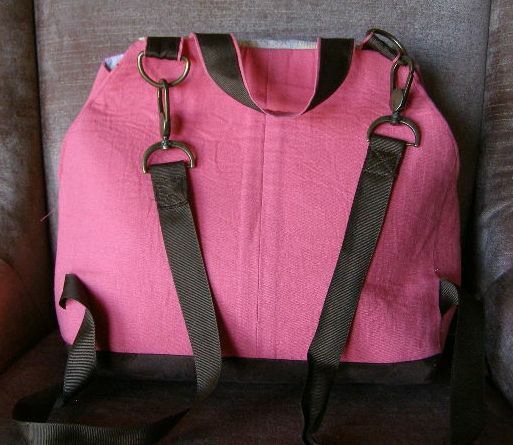 The body of the backpack is a coral linen left over from an ill-fated attempt to sew a dress. Having learned a lesson about purse bases and light colors, I added a layer of dark brown ultrasuede to form the base. The development of the pattern required much more time that it really should have. There are more than a few backpack patterns available. However, I did not want a drawstring -I don’t trust them – I believe drawstrings all hail from the 1960’s and seize every opportunity to cry “BE FREE” and release everything! The dimensions I finally decided upon were those of a paper bag from a gift store! Three snaps hold the backpack securely closed. The straps are simple brown grosgrain ribbon. The vertical seams in the fabric are leftovers from the attempted dress, but worked perfectly for lower strap placement on the back. The lining is a beige/white giraffe print. Interior pockets were the same as those in the Destashification Make-Up Bag. Another lesson learned from my early purse making experiments is that purses must be lined in a light color – dark colors create a “black hole”. Dark purse interiors make it impossible to find anything! Now, if technology could just develop a ink-pen-proof light colored fabric for purse linings! 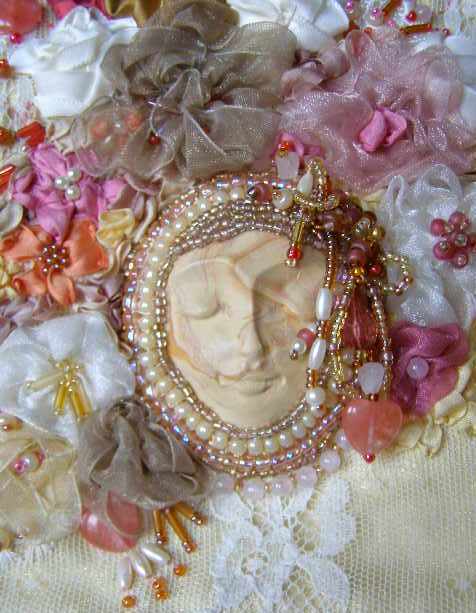 Embellishing is the Fun Part! When time allows I will post the pattern and a tutorial for the backpack. The flap is perfect for all that fun embellishment! 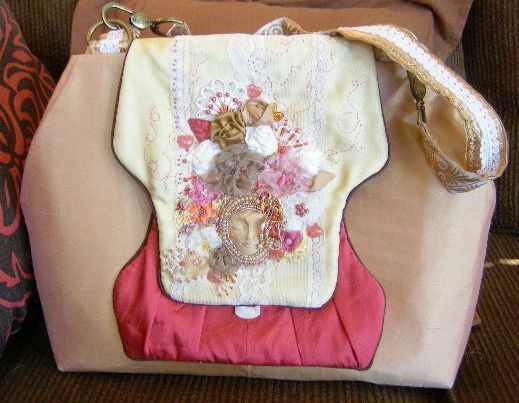 This entry was posted in Accessories, Crazy Quilting, Embellishment, Goddess, Purses, Repurpose, Sewing, Stash Couture and tagged sewing backpack. Bookmark the permalink. 3 Responses to The Purse d’Resistance is now a Backpack! Cool! All ready for more travel! Bad news! I cannot get the fabric we discussed so am having to reformulate. Conceptually depressing!